Click on the first sound file to hear all of the Nyungar words, one after the other. Nyungar have occupied and managed the south-west of Western Australia for over 40,000 years.1 It is our right and responsibility to care for our country. Nyungar is the name for the Aboriginal people whose ancestors originally occupied and still occupy the whole south-west.2 The word Nyungar means ‘person’ or ‘people’.3 As Nyungar language was not written prior to colonisation, there are many spellings of this word and most Nyungar words. Nyungar boodjar (country) extends from north of Jurien Bay, inland to north of Moora and down to the southern coast between Bremer Bay and east of Esperance. 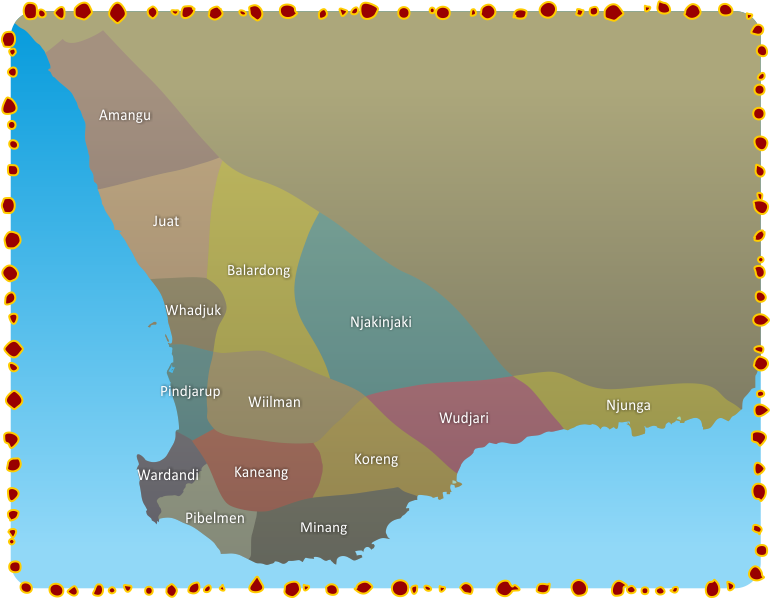 Nyungar boodjar is traditionally occupied by 14 Nyungar groups as shown on the map by Tindale: Amangu, Balardong, Juat, Kaneang, Koreng, Minang, Njakinjaki, Njunga, Pibelmen, Pindjarup, Wardandi, Whadjuk, Wiilman and Wudjari. Please note that this map is based on information from Norman Tindale's4 1974 attempt to depict Aboriginal tribal distribution at the time of European contact. His map is contested and controversial. Click on each sound file to hear all of the Nyungar words. 1. Hallam, S. J. Fire and Hearth: a study of Aboriginal usage and European usurpation in the south-western Australia. Advocate Press Pty Ltd: Melbourne. 1979. 2. Collard, L., & S. Harben. “Nartj Katitj Bidi Ngulluckiny Koorl? (Which Knowledge Path Will We Travel? ).” Studies in Western Australian History (26)75-95. 2010. 3. Mountford, A & L. Collard. Nidja Noongar Boodjar Noonokurt Nyininy (This is Noongar Country You Are Sitting In), Catholic Education Office of WA, Perth. 2000. 4. Tindale, N.B. Part II, Aboriginal Tribes of Australia: Their Terrain, Environmental Controls, Distribution, Limits, and Proper Names. 1974.